Graphene, especially the graphene single crystal, is a star material for future photonics and electronics due to its unique properties, such as giant intrinsic charge carrier mobility, record thermal conductivity, super stiffness and excellent light transmission. However, whether graphene can live up to the expectation depends on reliable, high-quality synthesis with high efficiency. Prof. Lei Fu said, "The natural property of liquid metal qualifies it to be an ideal platform for the low-density nucleation and the fast growth of graphene. Liquid metal catalyst possesses a quasi-atomically smooth surface with a high diffusion rate, which can avoid the defects and grain boundaries that are inevitable on solid metal. The rich free electrons in liquid Cu accelerate the nucleation of graphene, realizing the nucleation of graphene single crystals within seconds. And in the meantime, the isotropic smooth surface greatly suppresses the nucleation density. Moreover, the fast mass transfer of carbon atoms due to the excellent fluidity of liquid Cu promotes fast growth." They systematically studied the nucleation and growth behavior of graphene on solid Cu and liquid Cu. As a comparison with solid Cu, the nucleation density of graphene on liquid Cu exhibits a strong decline and the related activation energy also declines. As for the growth rate, the growth rate of graphene on liquid Cu is almost two orders larger compared to that on solid Cu. In order to elucidate the growth kinetics of the growth of graphene on liquid Cu, they employed carbon isotope labeling Raman spectra and time of flight secondary ion mass spectra to trace the distribution of carbon atoms in liquid Cu. They report that 13C and 12C atoms uniformly mix in each graphene single crystal, and a certain number of carbon atoms can be detected in the bulk of liquid Cu, compared to the situation in solid Cu with extremely low carbon solubility. 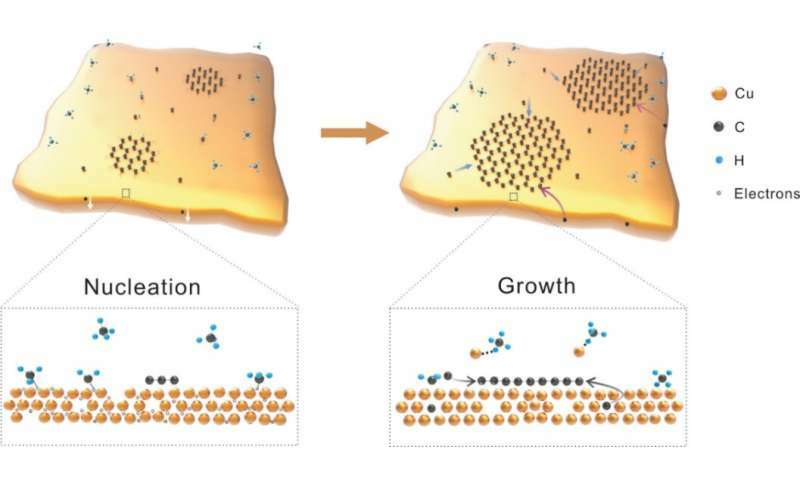 Unlike the surface adsorption growth mode on solid Cu, the precursor supply for the graphene growth on liquid Cu can come from the surface adsorption and the bulk segregation. This can be attributed to the rich vacancies in liquid Cu, in which carbon atoms can firstly diffuse into the metal bulk before segregating and precipitating toward the Cu surface. The binary contributions of the precursor supply, i.e., the surface adsorption and the bulk segregation, accelerate the fast growth of graphene. "We think the study on the growth speed of graphene in liquid Cu system will enrich the research map of the growth of two-dimensional (2-D) materials on liquid metal," says Prof. Lei Fu. "More interesting and unique behaviors in the liquid surface are to be discovered. The liquid metal strategy for the rapid growth of graphene will hopefully be extended to various 2-D materials and thus promote their future applications."